More than any other piece written for the musical stage, Jacques Brel is Alive and Well and Living in Paris defies description. It is an evening of independent songs (almost one-act musicals), yet it's not a revue. It doesn't have a plot or even an immediately recognizable cast of characters, so it's not really a book musical. We think it's a one-character musical with a cast of four. Two women and two men all portray one character: Jacques Brel. The words are Brel's, the opinions, insights, and satiric wit are Brel's. The underlying, sometimes nearly hidden optimism is Brel's. The show is more a character study than anything else, but we must ask if it is a character study of just Jacques Brel the man or also of western civilization at the end of the 20th century? Jacques Brel was born in Belgium in 1929 but moved to Paris to be a singer and songwriter. By the early 1960s, Brel had established a reputation as one of France's greatest writers and interpreters of modern songs. In 1957, the first American recording of Brel's songs was released. In 1961, Elly Stone sang two Brel songs, “Ne me quitte pas” (“Don't Leave Me”) and “La Valse mille temps,” (“The Waltz in 1,000 Time”) in a strange off-Broadway revue called O, Oysters! Though the show didn't run long, Stone continued to perform these two songs. In 1968, Eric Blau and Mort Shuman created an off-Broadway musical using twenty-five of Brel's songs, called Jacques Brel is Alive and Well and Living in Paris, and it ran for 1,847 performances. The show has been revived twice in New York. A film version was released in 1975, which included an appearance by Brel. Since the show first opened, Brel's songs have been recorded by artists as diverse as David Bowie, Judy Collins, and Barry Manilow. Brel died in 1978 at age 49, but they didn't change the title of the show. You'll see why tonight. Very few of Jacques Brel's songs are simple and straight-forward. He was a poet as much as a songwriter, and the words he writes often cloak a deeper meaning. So many of the songs in the show are not what they appear to be. “I Loved” is about being in love with the symbols of love instead of with a person. “Bachelor's Dance” is about unrealistic expectations. “My Death” is a view of death as inevitable but patient. “Jackie” is a man who hates his life and wishes he could return to the innocence and simplicity of childhood. “The Statue” condemns the false (and dangerous?) romanticizing of war and soldiering. “Brussels” is about denial in the face of danger. “No Love, You're Not Alone,” is about how we project our own sorrow onto someone else so that they will “need” us. Every single song is an adventure and a meditation. You'll never see another show like this one, and we'll never work on another show like this. So we really treasure this experience. This was one of my favorite New Line shows. Not only was the material challenging and inspiring, but also the small company was genuinely warm and supportive. 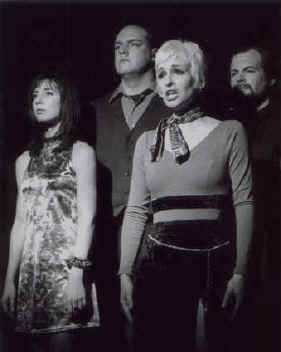 Many events during the run were memorable in their own right – Laura slicing her hand open with her umbrella during “Madeleine” (and finishing the last hour and forty-five minutes of the show with her hand wrapped in whatever clean cloth could be found); Mark hiding words to his songs in the doorway to steal a glance when he could; Scott and Brian demonstrating the complicated choreography of “Carousel” as the four of us watched in fascination and horror; Kevin's incredibly poignant rendition of “The Statue” resonating through a silenced house. However, there is one simple memory that sticks with me, too – the memory of Kevin's and Laura's hands holding mine while we stood in semi-darkness at the edge of the stage and sang “The Desperate Ones” and “If We Only Have Love.” At the end of each of those songs, there would be a quiet moment, and just before the audience applauded, we'd lightly squeeze each other's hands. That remains one of my favorite theatre moments. One of the most rewarding experiences that I had working with New Line was assisting with the choreography on both “Marathon” and “Carousel” for Jacques Brel is Alive and Well and Living in Paris. These two songs provided such a good framing mechanism for the entire show, incorporating all of the show’s warnings and prophecies into fiercely overt language and imagery. The choreography for both songs needed to mirror those warnings accurately. This was a large task because of the wildly different types of music in the show. Staying true to the music was necessary, and in the end, it is what made those two songs most effective. For “Marathon,” the lyrics “flashed” different images of various aspects of the twentieth century, ranging from “the twenties roar because there’s bathtub gin” to the prophetic “and the nineties whimper and the century hangs.” Scott and I spent hours working with different ideas until we finally ended up with a frantic, whirlwind tour of the century, the actors mimicking the lyrics. It opened the evening very nicely and set the stage for the rest of the show. The choreography for “Carousel” gave us fits because of the repetition and increasingly frantic pace of the music. Again, the music dictated the sense of urgency and warning, wrapped up in a seemingly innocent amusement ride. The circular motion of the carousel translated nicely into a tight circle that moved with the music, ever scarier, like a machine out of control. Johanna, Kevin, Mark, and Laura nailed the foreboding hand movements perfectly, and I was always left breathless on the final beat. The most satisfying aspect of working with Scott on the choreography for Brel, and these two songs in particular, was that it was a truly organic process. We tried things. We researched. We argued over ideas. We consulted the cast. The music was revisited over and over again to insure that everything was timed perfectly and that it continued to make sense, even in the waning days of rehearsal. In the end, I believe those two songs really shone through because of the work and the attention to detail that we gave it. At no point was the message of Brel compromised by the movements of the actors, one of the many things that I am most proud of during my work with New Line.